Besieged by love? 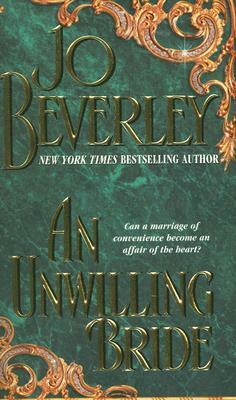 How many times have you read something like “her emotions were under siege” in a romance novel? I feel like this metaphor is common, and compelling, yet I’ve never really unpacked it. For one thing, it suggests a traditionally gendered experience, in which the hero is the pursuer, surrounding the heroine with his army of manly charms until she accepts and gives in to the inevitability of surrender/conquest. 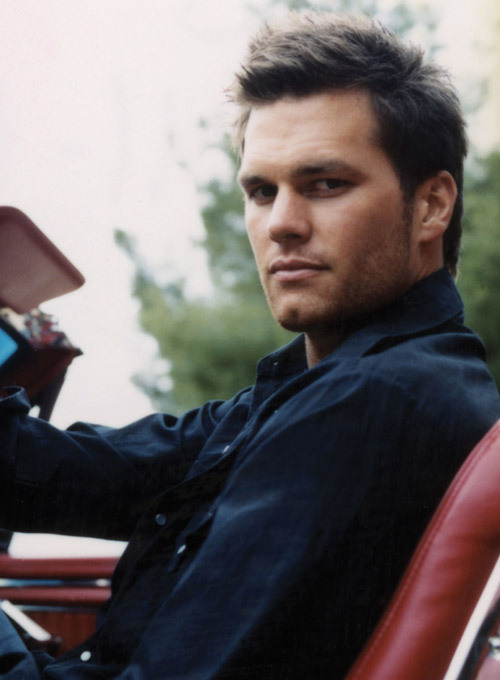 Until last month, it’d been quite a while since I read a romance, or indeed any novel, where the hero wears chain mail. Then I picked Sharon Kay Penman’s LIONHEART off a very dusty spot on my TBR shelf, for a “challenge” read involving Big Fat Books. Not a romance, but it reminded me how much I used to enjoy and immerse myself in historical fiction with medieval settings, and whetted my appetite. Also, here was a book brimming with literal historical examples of siege warfare, replete with all the implements (heavy weaponry, grappling hooks, scaling ladders) and strategies (starvation, persistence, ruthlessness) from which the literary & emotional metaphors derive. I confess, I had to push myself a bit to get through this long book about England’s Richard ‘the Lionheart’ and his exploits in the Holy Land during the Second (?) Crusade in 1190-92. Based on my memories of Penman’s Welsh trilogy (it was nearly 20 years ago, but I treasure these books among my ‘best evers’), I had thought there’d be a stronger romantic element, and I found myself really missing the emotional satisfaction of a romance HEA. I also missed the sense that there is an end to the story at all, since this was just one long chunk of a multi-novel Angevin saga, and leaves off just as Richard is returning to England to deal with his treacherous relatives. So – time for a medieval romance. Fortunately, hard on the heels of my March reading challenge came SIEGE OF THE HEART, a debut release from Elise Cyr, an author acquaintance from Twitter. I am thoroughly enjoying this romance between a Norman knight and a sword-wielding English heiress, and it’s got me re-examining some of my own assumptions about medieval romance novels, thinking about why I stopped reading them, whether they’re still as popular as ever, and what’s happening in this historical subgenre that’s new and fresh. Is harsh history romantic? Elise has graciously agreed to share some ideas about medievals – the chivalry, the history, and what makes a romance novel work in a setting where historical accuracy means a world with a challenging dominant belief system characterized by religious intolerance, a rigid feudal class system, very limited access to literacy and learning for most people, and marriage laws that left women with very few rights, even over their own bodies and children. Pamela: I just read a great review of Jeannie Lin’s THE JADE TEMPTRESS in which Miss Bates referred to the setting – also medieval, but 9th century China – as a “harsh, hierarchical world” (I can’t wait to read this one, too!). What makes this kind of setting a good place to tell a compelling love story? Elise: It comes down to stakes. In the medieval period, regardless of which continent we’re talking about, the “harsh, hierarchical world” often meant most people were so focused on their survival and that of their family, the concept of “love” we think of today was rare as a result. The medieval version of Maslow’s Hierarchy of Needs often didn’t move beyond food and shelter for the vast majority of people living at the time. So when love did strike, the afflicted had a lot of barriers to work through. Not least of which was the concept of marriage, which was essentially a contract negotiated between families at the behest of their liege lord. Compatibility had more to do with dowries, ready coin, and the whims of nobility instead of attraction, passion, fidelity. So love not only had to exist, it had to be a love worth fighting for, since often the couple would be going against the wishes of their families and their liege lord, removing any security they had in society. It was a harsh world indeed for lovers of the time. Pamela: What do you think is the particular appeal of the European-set medieval? Are there deeper associations with folklore and fairytales many English-speaking readers may have grown up with? Pamela: I kept thinking about your siege metaphor as I was reading about the Crusaders’ trebuchets and other siege implements and strategies, in Penman’s LIONHEART. That was a later period than SIEGE OF THE HEART, which is set immediately following the Norman Conquest, but the forced marriage as part of a strategy of conquest, alliance, and/or assimilation is a common theme. It’s a tried and true historical romance trope, but I think it can be particularly powerful in a medieval story – how does it work in medieval to become more, and to transcend the plot device that serves to throw the hero and heroine together? Elise: The forced marriage trope is indeed common in historical romance. The reason I think it works in medievals is because the marriage is bigger than either partner, and more is riding on its success. Servants, townspeople, villeins, and vassals all had a stake in the success or failure of an alliance. The term “peace weaver” originates from the Anglo-Saxons where a woman was married off to a warring tribe to make peace (http://en.wikipedia.org/wiki/Peace-weaver). To have so much riding on a match raises the stakes for a relationship, and finding ways for the hero and heroine to connect, compromise, and complement each other are elements at the heart of any romance, regardless of the time period. 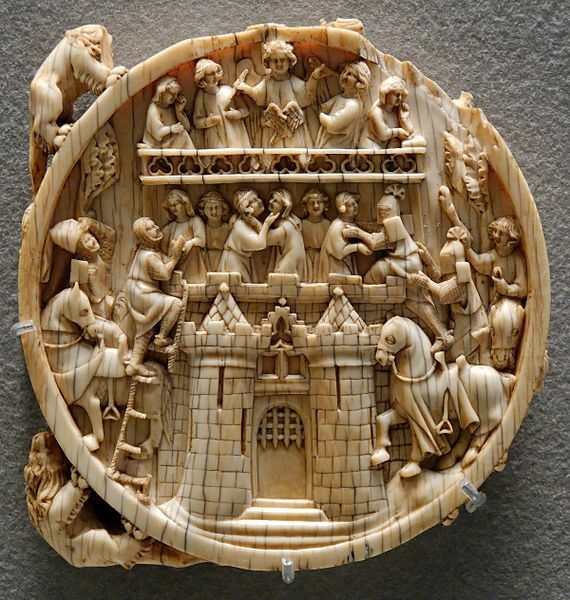 Pamela: Isabel faces a forced marriage like so many widowed or otherwise vulnerable women of the ruling class in her period, because a single woman can’t “hold” a castle, or a kingdom, for her liege lord, and needs to be married to another powerful lord. But in what ways does she hold power? Can she hold on to her own inner “castle” – ie. her heart, at least until she chooses to open the gates…? Elise: When I chose to write in this time period, I soon realized the cards would be stacked against my heroine Isabel. The fallout from the Norman Conquest threw so many lives in turmoil, including that of an unwed English noblewoman. So I had to figure out a way to not only make her someone worthy of a story, but also have enough agency to sustain one. That way a modern reader could respect her choices despite changes in culture and gender roles brought on by the march of time. It helps that my heroine is a bit spoiled by her father, still mourning the loss of his wife. Because of this, Isabel has been afforded opportunities to acquire certain skills and experiences not available to other women. Her power lies in the respect she commands from her father’s men and the rest of the household, her knowledge of the land and the vassals who tend it, and the passion she brings to her responsibilities. The result, I hope, is a strong character, cognizant of her place in the world, confident in her abilities, who realizes her heart is only hers to give. Siege of a motte and bailey castle at Dinan as depicted in the Bayeux Tapestry. Via Wikimedia Commons. Pamela: Beyond her inner qualities and skills such as strength of purpose or being politically astute, you also gave Isabel an outwardly fighting spirit and weaponry and badassery to go with it. She’s quite a shield-maiden, and in this way reminds me of the warrior maidens from a Tolkien saga, or the early Norse mythologies that inspired him. What made you decide to have Isabel be skilled at physical combat in her own right, in spite of needing to marry in order to retain dominion over her family’s lands? Elise: Well, badassery was indeed a consideration. One thing I always disliked about fairy tales was the passive or secondary role women often played. I didn’t want that for my heroine, especially given the modern lens and the power dynamics of the time. So I wanted her skills with blade and bow to match her fighting spirit. She couldn’t be easily dismissed, politically, personally, physically. If you dig into the accounts of the Conquest, it wasn’t very pretty. I wanted a heroine who could transcend the brutality of the time period and be strong enough to pick up the pieces afterward. Pamela: Alex is a wonderfully patient yet determined siege strategist. It’s refreshing to read a medieval warrior hero who’s open about his willingness to fall in love with the heiress he’s being commanded to marry, rather than bemoan his lost bachelorhood or succumbing to insta-lust for wedding, bedding, and then ignoring his new bride. He approaches Isabel as he would any worthy potential adversary or ally – and only once he realizes that he’s attracted to her, both physically and in terms of her character, does he decide upon a courtship strategy of emotional siege warfare. So many romance novels cast the hero as the protagonist whose deeper emotions are walled up behind a mental fortress – did you think about this as an inversion or subversion? Elise: I did try to invert some expectations when it came to Alex, the Norman knight who throws Isabel’s world in turmoil. Going back to the brutality of the Conquest, it’s easy to assume that bloodlust is what defined the conquerors as they raped, pillaged, and razed the land on their trek from the coast to the heart of London. I felt not every man William brought to England could be ruled by such aggression—these very knights were the origins of chivalry after all, formalized roughly a hundred years later. As a conqueror, it’s easy to view Alex as a “bad guy.” So I tried to give Alex those honorable, chivalric impulses, while retaining the rough edges of the Norman culture. Having him in touch with his emotions, aware of how he’s perceived by others and how to manipulate that, were tools I used to keep him accessible to the reader. I also wanted to highlight his leadership qualities—he may be a landless knight, seeking his fortune in England, but he is still worthy of a noblewoman like Isabel. Pamela: They do seem very well-matched, and I am looking forward to finishing their story. 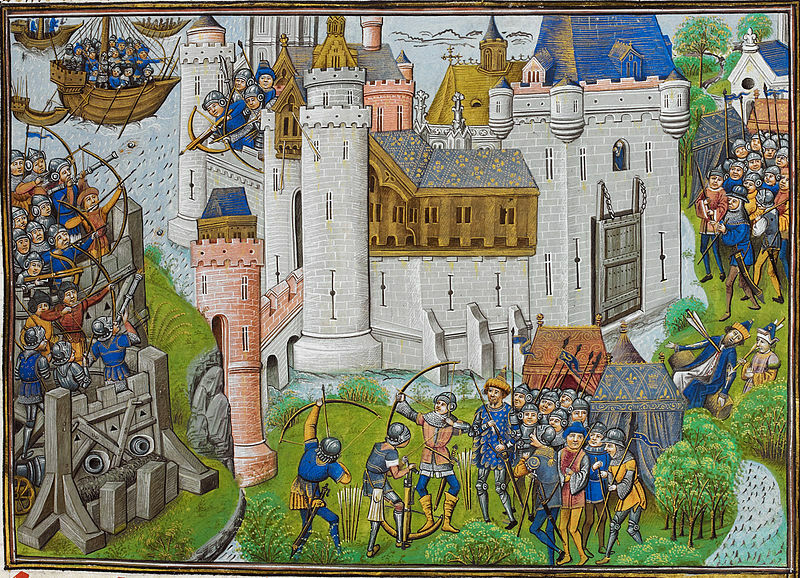 Siege of Mortagne (Hundred Years War) from a 14th century Flemish manuscript, via Wikimedia Commons. 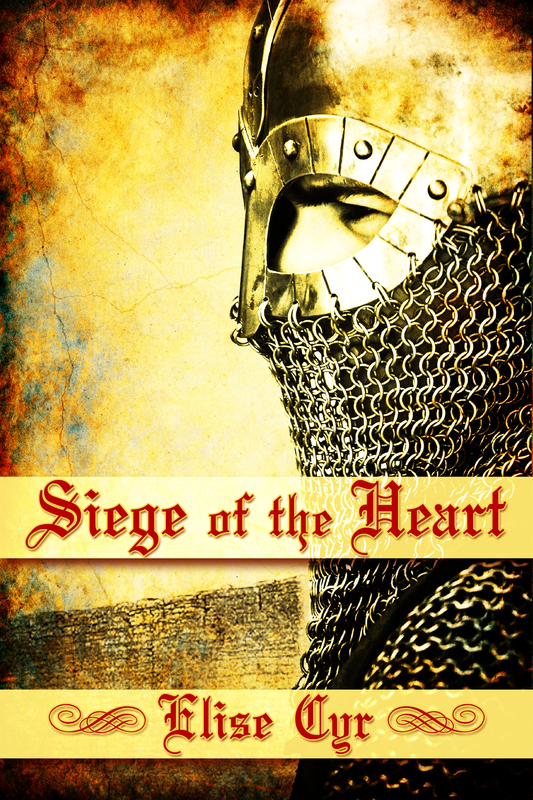 From the publisher, about SIEGE OF THE HEART: He fought for king and country, but that battle was nothing compared to the one he’ll wage for a woman’s heart. Still reeling from the news of her father’s death during the Norman Conquest, Isabel Dumont is unprepared when trouble arrives at the castle gates. Alexandre d’Évreux, a Norman knight with close ties to England’s new king, has arrived to secure the land and the loyalties of the Dumont family. Desperate to protect her people, Isabel strives to keep the confounding knight at arm’s length and hide the truth about her father’s death. SIEGE OF THE HEART is available from Kensington as an e-book in the usual places. I believe a print edition is forthcoming. I’m grateful to the publisher and to Elise for sharing an e-ARC with me.